This is my second double knit hot pad. As you can see it's reversible. Why two of them? Well, I'm actually trying to learn how to do this better so I can begin working on my strap for my pilates bag. I can't quite seem to get the right tension for the length of the one row because the two yarns held together get all tangled up around my tensioning pinky and won't pull through. If I don't wrap the yarns, I have like no tension for the purl color. I've tried double knitting devices, and while they do help to keep the strands separated, they really stink for workability when going from one color to the next and back. I've tried wrapping the knit strand with the pinky tensioning and over my index finger while the ring finger tensions the purl strand and comes up over both the middle and index fingers, but again they get twisted. The best approach I've been able to come up with so far is to hold both strands as I normally do which is without wrapping for tension and using an o-ring on my finger to keep the strands apart; a system that works, but needs a slightly larger o-ring for comfort and height. UPDATE: there is a chart for the 3 Leaf Clover and a more recent post, too. 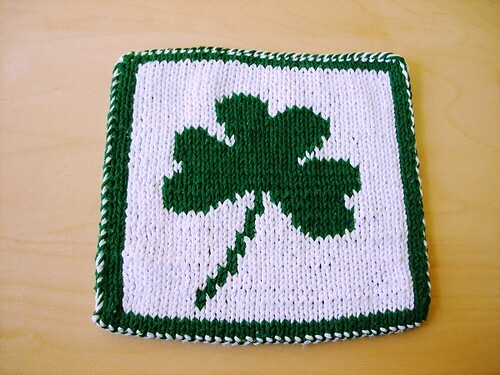 Did you ever post a pattern for the shamrock? Love it! Yes! I did - just now! I forgot all about getting the chart online. A little late, but there's always next year!